Tirzah’s graver gleefully records the casual movements and expressions of a crocodile of Tirzah chattering schoolgirls, visual counterparts of Miss Jean Brodie’s Garwood pupils, and brings us face to face once more with the wind buffetted woman of March. Here she figures in one of the Relations series and appears at a dog show wearing jacket, tie, breeches and thick woollen socks and holds the terrier on her fat knees. Another woman stalks across the foreground of the print blowing her nose and clutching the leads of a Dalmatian and five dachshunds, two of them already beyond the edge of the engraving. This cut is a particularly fine example of the artist’s skillful use of different tools to create the diverse textures of wool, wood, fur, leather and straw and a wide range of tone varying from white to the delicately engraved black of the foremost dog. In one or two of these engravings high spirits and humour are given a sharper edge by nightmarish fancies. They adumbrate the darker facets of the artist’s imagination which were to be more strongly expressed in some of her paintings. One of these prints shows a man starting back with alarm as he answers the telephone and hears his own voice addressing him; in another a woman who has come to feed her hens is confronted by monster fowls towering above her. Yet another vital element in Tirzah’s work is revealed by her meticulous and exquisitely composed engravings of plants, insects and wild creatures. Her father was an enthusiastic naturalist and she shared this partiality. The acuity of Tirzah’s observation of bees and beetles, snails and spiders, fungi and flowers sets these prints apart. The love and knowledge on which they are based were later to inform her most whimsical paintings with an air of deepest conviction. Enough has been said to indicate that there is little trace of Eric Ravilious’s influence in his pupil’s work. 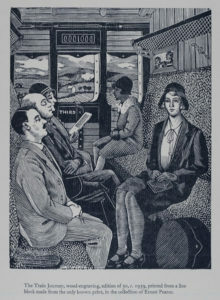 A comparison of Tirzah’s engraving (shown opposite p. 6, though not included in the Gordon Fraser book) of the interior of a railway carriage, with Ravilous’s watercolour of the same subject done in 1939 (illustrated on the dust jacket of The World of Eric Ravilious, Scolar Press, 1982) and possibly inspired by his wife’s print, brings out the sharp contrast in their points of view. The simplified compartment in the watercolour is empty; the eye goes at once to the Wiltshire landscape and the chalk cut figure of the Westbury white horse framed by the window. 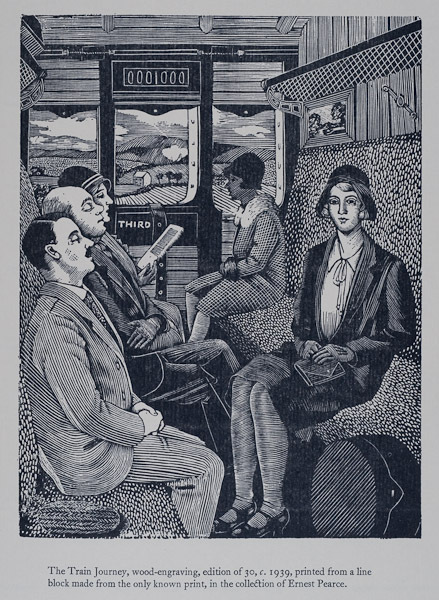 Tirzah’s minutely detailed engraving concentrates on the occupants of the compartment, a woman reading, a girl idly watching the changing view of trees and hills, two men asleep, one with his mouth half open, and opposite them Tirzah, lost in thought as she turns towards us. In 1930 Tirzah married Eric Ravilious. For a short time they lived in Kennington and Hammersmith; the rest of their life together was spent in Essex, first at Brick House, Great Bardfield which they shared with Edward and Charlotte Bawden, then at Bank House, Castle Hedingham and later, from 1941, at Ironbridge Farm, Shalford.